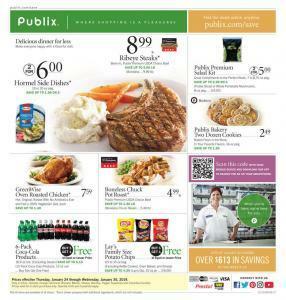 Make everyone happy with a flavourful dish with Publix Weekly Ad Deals Jan 24 - 30, 2019. There are delicious dinner dishes for less. First of all, let's talk about meat varieties. Ribeye steak, roasted chicken, boneless chuck pot roast and many more options are available. Also check out buy 1 get 1 free offers especially on coca cola beverages, family size potato chips etc. New items on sale now at Publix. 5 cheese tortellini, green wise organic tea, bacon cheddar salmon burger are favourite offers of the category. Another great deal is buy 1 get 1 chance on wine varieties. If you like to have a glass of wine with dinner, don't miss the low prices. This week's recipe is sugar and spice crusted steak and spiced baby potatoes. It's a great dinner choice for a special day. You can pair a good wine with it and enjoy your night with your loved ones. Seafood lovers are lucky this week. XL white shrimp, fresh salmon fillets, cold smoked salmon and cooked shrimp is also on sale. On page 5, many other meat varieties are available. You can save up to $1 on chicken and pork choices. Take a look at page 6 for fresh, ripe and beautiful fruits. In addition simply 100% orange juice selections can be found. When it comes to side dishes, boiled fresh vegetables are your best friend. Check page 7 for avocado, sweet peppers, celery options. Bakery category is another great part of this week's ad. Sandwiches and salads would be good for lunch time at the office. My favourite is Publix Deli oven roasted Turkey breast. Take a look at page 9 to get the best rolls, cakes and breads. Page 10, 11 and 12 are all about BOGO deals. Look and choose the options to stock up. You can find too many dishes from all categories. There is of course good prices on household items and health and beauty products. Enjoy high quality lotions, protein shakes and more. Publix cares about your bathroom needs indeed. Fill your daily needs with special prices and also don't forget to get food for your furry friends. On page 15 baby products like formula and diapers are available. This way you won't have to shop from different shops and buy all your weekly needs for yourself, for your pet and for your baby. Finally, plan your shopping list and ease your shopping experience with Publix ad every week.